SUU’s Department of Theatre Arts & Dance will present William Shakespeare’s Richard III on September 28, October 1, 4, 5, 6, 2018 at 7:30 p.m. in the Engelstad Shakespeare Theatre. Tickets are $10 for adults, $8 for alumni with card, and $5 for youth. SUU faculty, staff, and students can get in free with a valid ID card. Tickets can be purchased at the America’s First Event Center Box Office, at the door the night of the performance, or online at www.suu.edu/pva. Peter Sham, Associate Professor of Theatre Arts and Director of Richard III, declares, "Perhaps no Shakespeare play deals with the complexities of power, malevolence, revenge and loss, like Richard III. By far my greatest joy as an educator is going on a journey like this with students nearing the end of their college training and about to embark on their professional careers. 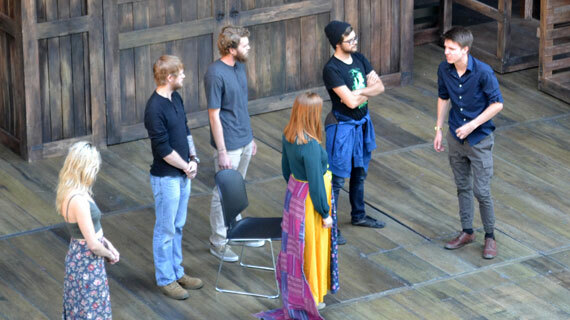 And the added privilege is that we have the opportunity to explore this dynamic text and story on one of the finest outdoor stages in the country, the Engelstad Shakespeare Theatre." Based on the life of King Richard III of England, this historical play brings to life the deceit and insecurities of this famed ruler. As students delve into the characters, their understanding of power and the balance needed to refrain from being overcome with pride have truly enhanced this production. Experience the depth of Richard III as students perform this production of power and deceit. For more information, please visit www.suu.edu/pva/ta.